applying these Assistant Manager jobs in DNS Bank. Engineering and diploma candidates are not eligible to applying for this Dombivli Nagar Sahkari bank recruitment of Assistant Manager. Online link for this DNS Bank Assistant Manager vacancy will be active from 20-11-2017 to 04-12-2017. Selection of these Assistant Manager jobs in DNS Bank will be through written exam only. More details of this DNS Bank Assistant Manager recruitment exam pattern, age limits, pay scale and other related information is given below. 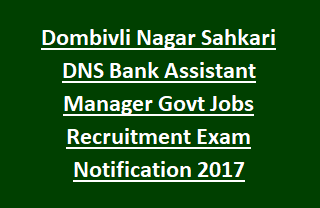 There are total 40 Assistant Manager jobs in this DNS Bank Recruitment Exam 2017. As on 01-11-2017 candidate must have age in between 21 years and 28 years. Must have born after 01-11-1989 and before 30-10-1996. Candidate must have qualified degree and should have computer knowledge. Candidates of Engineering, Diploma and Medical are not eligible to apply. Candidates will be selected based on written exam and interview. Written exam will be conducted for 200 marks. Total 4 sections will be given and each section will contains a specific time. Candidates have to complete the selected section in the given time. Rs. 500/- for SC / ST / OBC / BC / NT candidates and Rs. 600/- open category candidates. Online applications will be accepted through DNS Bank official website of www.dnsbank.in. Last date for submission of application form online is 04-12-2017. Must have upload image and signature along with mobile number and email id.